The big-box retailer jumped on a surprisingly strong earnings report and bullish expectations for Donald Trump's victory. Shares of office supply retailer Office Depot (NASDAQ:ODP) skyrocketed last month on a better-than-expected earnings report and Donald Trump's election victory. According to data from S&P Global Market Intelligence, the stock gained 54% in November. As the chart below shows, those gains came in several spurts over the course of the month. 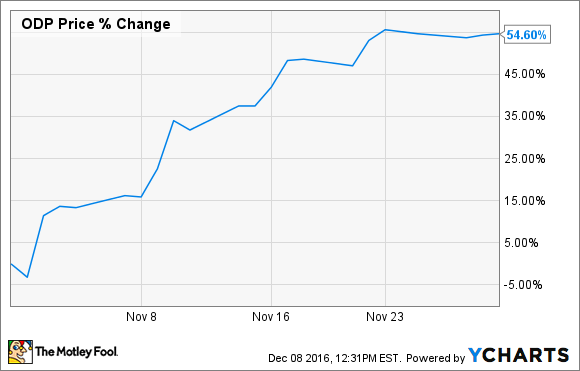 After posting third-quarter earnings on Nov. 2, the struggling big-box chain's shares jumped 15%. Revenue fell 7% to $2.8 billion as comparable sales slipped 2% and it shuttered stores. Adjusted earnings per share dropped from $0.17 a year ago to $0.16, but beat estimates by a penny. It was the first time in more than a year that the company had exceeded earnings estimates, prompting cheers from the market. During the quarter, Office Depot began to implement a strategic three-year plan, which includes closing 300 underperforming North American stores and selling nearly all of its international operations. Later in the month, the stock gained 16% in the two days after Trump won the election, a reflection of the market's belief that a Trump administration would be friendlier to businesses by lowering corporate taxes and instituting policies that help control labor costs. Rival Staples also jumped on the news, and Office Depot continued to rise for the rest of the month, riding the broader market rally. Office Depot plunged earlier this year after its merger was blocked by a federal judge, but its third-quarter report seems to have restored the market's faith in the office-supply retailer. Though it operates in a declining industry, it continues to be profitable and the stock trades at a P/E of just 9. Its plan to scuttle the international business and close underperforming stores should help it sustain those profits. For the current quarter, management expects sales to decline again but less so than in the third quarter. It also plans to close 65 stores in the period, and maintained its full-year adjusted operating income guidance of $450 million to $470 million, up from $438 million last year. For fiscal 2017, the company expects to achieve adjusted operating income of $500 million. Despite apparent challenges, Office Depot looks stronger than many would expect. The stock should continue to move higher if management can execute its plan and meet its guidance.